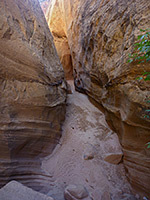 Cottonwood Wash is one of several slot canyons running through the huge white Navajo sandstone peaks that make up the highest parts of Capitol Reef, and like the others, it is relatively short but in places very deep. 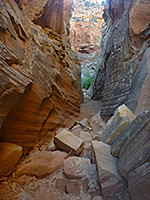 The narrowest passages are interrupted at intervals by chokestones, dryfalls and pools, and such obstacles eventually block access from the lower end, though Cottonwood can also be entered from the top, albeit after a longish drive on a 4WD track along the inside of the reef, though again only a short distance is easily followed before the stream encounters a 40 foot drop. Most people just explore the lower end, which is easily accessible from the paved Notom-Bullfrog Road. 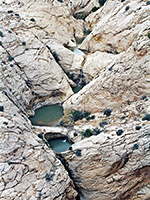 The wash is the second of three narrow canyons to have a marked trailhead along the paved section of the Notom-Bullfrog Road, and is reached after a 9 mile drive south from its junction with UT 24. There is a good camping/parking area under a cottonwood tree on the west side of the road, where most cars will have to be left, but 4WD vehicles could continue beside, or along, the creekbed for a mile or so upstream, to where the canyon starts to deepen and become rocky. 22 views of Cottonwood Wash.
Topographic map of Cottonwood Wash. 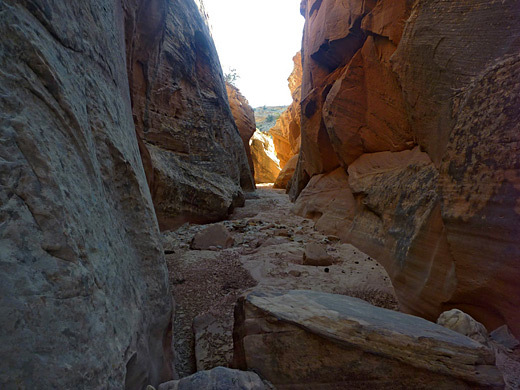 It takes just 15 minutes to walk up the level, sandy valley, crossing the streambed several times, round a short bend then two wider bends, to the edge of the angular foothills that mark the start of Capitol Reef, and where the wash starts to form a canyon. A well defined path continues upstream, cutting across a few meanders then rising quite high above on the left side to bypass a rocky section filled with many large fallen boulders, descending back to creek level just above a dryfall and pool. The next stretch has undulating, stepped terraces where the strata are nearly horizontal, and the waters, when flowing, spread out across the level sections then drop over little falls into fluted cavities and potholes. After a few more bends, the ledgy, red-brown layers of the Carmel formation are replaced by the huge whitish rocks of Navajo sandstone which comprise the center of the reef, and these soon rise high and sheer above the streambed so the canyon becomes deep and the main narrows begin. The floor remains generally level with just a few small chokestones and dryfalls, and after a few minutes walking the canyon is 100 feet deep and has quite pretty, reddish/black passages. A tributary joins from the left then the main drainage enters a thin, straightish section which often holds several large pools, their size dependent on the amount of recent rainfall; the largest can be 6 feet deep and so may put an end to easy progress. Next is a more open section followed by a lesser pool preceding a tight but shallow narrow channel, and then, a few minutes further, a similar enclosed passage blocked by a huge chokestone, 10 feet high, with a climb-through route underneath. Another large chokestone is reached soon after, above a circular, sandy pothole that may have as much as 10 feet of water after rains, or be completely dry. The twisting slot around here soon opens out again, but other shallowish narrows continue, often angled quite far from vertical and tapering at floor level to a sharp point, so walking further upstream is quite difficult, and requires some steep upclimbing. Eventually the canyon is blocked by an impassable 35 foot dryfall - a point about half way through the narrows, and the fourth place where rappelling is used if descending from the top, but the journey to here is enjoyable and challenging, encountering some pretty passages and a variety of obstacles. 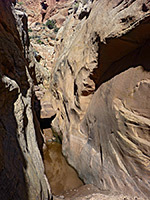 In general there are no easy ways to climb around the obstacles in the lower canyon owing to sheer cliffs at either side, but if pools prevent progress at floor level then an alternative way to see the canyon is by climbing high above, on the north side. Several places offer a route upwards, over clayish ledges and slickrock slopes, to a summit at 6,655 feet, at the top of ridge formed of Navajo sandstone domes. This point gives fabulous views of the main canyon and of a north-side tributary, the lower end of which contains a nice series of circular potholes. All around are the huge curving peaks at the center of Capitol Reef, with flat desert to the east and the Henry Mountains beyond.